One reason the Twins were successful in their stadium quest is because they convinced enough long-time stadium opponents to change their minds and support the plan. The package permits a .15-percent sales tax in Hennepin County to pay for the bulk of the $522 million project. Twins owner Carl Pohlad will contribute $130 million. The sales tax does not need voter approval, something for which the stadium opponents lobbied. Rep. Greg Davids, R-Preston, voted against every stadium plan for the past decade, but voted for this year's proposal. Davids says he told the Twins to find a way to build the stadium without using state taxpayer money, which this plan does. "They took advice that I and others have given them as to why we have been voting 'no' in the past," Davids said. "It would have been a bit hypocritical for me to ask them to do something and then they come back with a plan I ask them to do and then I vote against it." For the past 11 years opinion polls showed strong public opposition to spending taxpayer dollars on a Twins ballpark. Lawmakers and Gov. Pawlenty decided to support the plan despite the long-standing opposition. Some of the lawmakers who opposed the stadium say colleagues who relented were worn down by the decade-long debate. Rep. Kurt Zellers, R-Maple Grove, says stadium fatigue combined with a sales tax limited to one county allowed lawmakers who don't live in Hennepin County to vote for it. "The fatigue factor was one of the big things. People have heard about it for 10 years. They have been so close so many other times and then the fact it was 86-to-1 -- eighty-six counties to 1," Zellers said. Another reason the Twins will get a new address is a recent court decision that said the Twins don't have to play in the Metrodome after this season. Gov. Pawlenty says the ruling gave the Twins the very real option of leaving. "Until the court actually said they can leave the Metrodome, we kind of had them. And once the courts said 'you can go,' it opened up a much bigger risk window," Pawlenty said. Despite a green light from the courts, Twins officials never threatened to leave this year. In 1997 there were threats that the Twins would be sold and move to North Carolina. Even so, the Legislature decided against building a new ballpark that year. The team wasn't sold and obviously didn't move. Long-time stadium opponents insisted there was little risk the team would leave after this year either, even if lawmakers said no to a stadium again. DFL Sen. John Marty of Roseville says he's disappointed the Legislature decided to use taxpayer money for a new Twins ballpark. He says lawmakers will have to debate spending public money for sports stadiums until they draw a line in the sand against it. "As soon as we're done with this, we'll be taking up the Vikings next year and the Timberwolves will be two years later. It doesn't go away," Marty said. "The greed of this broken economics system which taxpayers are just dumping money after, against public will. Against strong public opposition." Some of that public opposition may show up at the polls. During Minnesota Public Radio's Midday program on Monday, one long-time DFL voter in Hennepin County said she would vote for Republican Gov. Tim Pawlenty and even give him a campaign contribution if he vetoed the Twins bill. Another caller who identified himself as John, from Hennepin County, said he and his wife are longtime Republican donors. He says he won't vote for anyone who supported the stadium. "Because this tax increase was shoved down our throats without a referendum, we will no longer support any politician who voted for that Twins stadium and that includes Gov. Pawlenty," he said. Pawlenty may not be the only politician who could lose votes for supporting a Twins ballpark. DFL Sen. Steve Kelley's push to fund a Twins stadium could cost him the votes of party delegates in his quest to receive the DFL endorsement for governor. And any state lawmaker who represents Hennepin County could also face a backlash if they voted for the ballpark. The proposed ballpark will rise out of what is now a surface parking lot located just north of the Target Center and just south of the Hennepin Energy Resource Company -- often referred to as the garbage burner or by the acronym HERC. The stadium will offer spectators a view of the skyline of downtown Minneapolis. It will also offer close proximity to parking ramps and access to highways I-94 and I-394. Hennepin County Commissioner Mark Stenglein says the site's access to the proposed Northstar commuter line and an extension of the Hiawatha light-rail line make it an ideal spot for a 42,000 seat stadium. "That's what sold me on this site six years ago, when the fellow then who owned it said 'Commissioner, look at this.' He had an architect do a rendering on a piece of foam board with that site with all the future rail lines intersecting right there and then the parking garages right there," he said. The 16-acre parcel of land is owned by Houston-based developer Hines International. 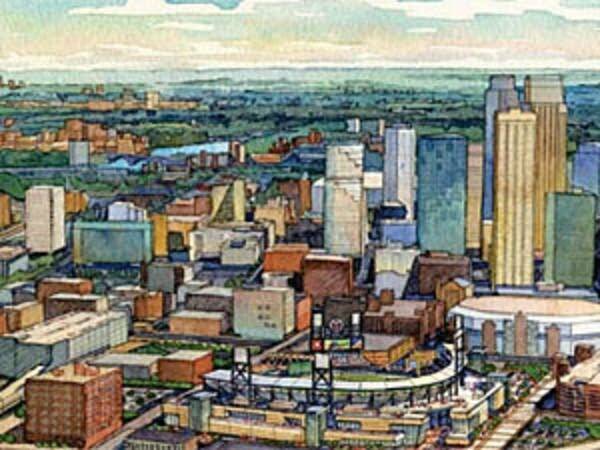 The developer has proposed building 1,000 condomininums near the Twins stadium. Before it was converted to a parking lot, the land was owned by a railroad company. Chuck Ballantine, the director of Hennepin County's Housing, Community Works and Transit Department, says soil samples will be taken from the site to test for pollutants. Ballantine says he expects to find soil similar to that underneath the nearby Energy Resource Company. "There was some railroad-related soil issues that had to be dealt with, so some mitigation measures were done relative to that," according to Ballantine. "And some of the soil ended up in the berms by the HERC, but there was nothing that stopped the project from going forward and I don't think there were extraordinary extra costs. And we've included some money in the budget in case there is environmental mitigations needed." If substantial problems are found after digging up the dirt, there is a 'no-build' clause in the agreement between the Twins and the county that can be enacted. That would cancel out the agreement and the Twins would go back to playing in the Metrodome. The Twins are also obligated to pay for the environmental impact statement. The EIS will look at a host of potential effects a downtown stadium will have on the surrounding area. For example, the participants in the fact-finding process will try to estimate the amount of car traffic and the air pollution those cars will bring to the area on game days. Chuck Ballantine says the county is particularly interested in keeping an eye on the nearby garbage burner. "We're going to be looking at Hennepin Energy Resource Company facility, which is right next to the park. It is in full compliance right now with MPCA guidelines. But we just want to take another look at that just to make sure it won't have any ill-effects on the ball park," he said. Ballantine says HERC may also be a source of heat for the ballpark. The mass-burn plant incinerates 365,000 tons of garbage a year and produces enough electricity to power 25,000 homes. Ballantine says the county is interested in exploring how to use some of the leftover hot water to heat parts of the stadium. "Currently we're shipping the hot water that is a byproduct of the steam driving the turbines into a set of coolers; cooling the water down to a point where we can recycle it and use it again in the plant. The question is, is the temperature as such or the technology such that maybe we could use that and transmit it to the ballpark." Within the next few weeks the Hennepin County Board of Commissioners will set dates for public hearings on the stadium tax hike. The board is required to hold a public hearing before voting on any tax increase. Commissioners say they will likely hold three, including some outside of the board room in downtown Minneapolis, in order to get more citizen input. While Commissioner Mike Opat is cautious, he says it looks as though the four board members who have supported the increase won't change their minds. "I don't ever think that anything's done until it's done," he said. "So we're a step at a time. We need the governor to sign the bill and all indications are he'll do that. And then we're going to spend sometime thinking about how the process is laid out and then go forward. But I think the four have been solid supporters."